A quick view of the most influential metrics in Hillcrest. The neighborhood of Hillcrest is a part of the city and county of San Diego, California. The neighborhood is located between Balboa Park and Mission Valley and is known for its firm stance on tolerance and acceptance of all people. 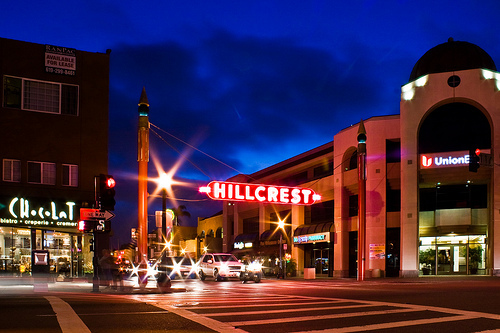 Hillcrest is considered San Diego’s first suburb and the heart of San Diego’s vibrant LGBT community as well as the birthplace of the Pride Parade held annually since 1975. The event has grown every year, the parade now has over 200 floats and attracts more 200,000 people. The community has gone through a gentrification process and is now a walkable neighborhood featuring tree lined streets, cafes, eclectic shops. The first residents of the area were they Kumeyaay Indians who had villages scattered through the region. The first Europeans to settle in the area were the Spanish. The area was governed first by the Spanish, then Mexico and lastly the United States. The area that would one day be Hillcrest was first deeded in 1870, to Mary Kearney. The land was then purchased by developers in 1871 and then by George Hill. Development did not begin in the area until 1910 and construction in the area was completed by 1920. The neighborhood was connected with other portions of San Diego by streetcars, which ran up until 1939, and the neighborhood became a popular shopping spot. The neighborhood was ranked among the top ten Greatest Neighborhoods by the America Planning Association in 2007. The neighborhood of Hillcrest embraces a rather bohemian atmosphere and all things vintage, eclectic and retro. There is a variety of vintage stores carrying used book, records, vintage furnishings and clothing. There are also stores featuring chic designer clothes, fashion footwear and unique novelty items. Popular eateries in Hillcrest include, Mama Testa Taqueira, Hash House a Go-Go and the R'Gang Eatery led by Rich Sweeney who gained renown on "Top Chef." There is a year round farmers market open Sunday and the city hosts Cityfest, the San Diego Pride festival and Pride Parade as well as Mardi Gras celebrations every year. Hillcrest is home to the Scripps Mercy Hospital and the UCSD Medical Center. The neighborhood was ranked among the top ten Greatest Neighborhoods by the America Planning Association in 2007. The Hillcrest neighborhood is welcoming and warm as is made up of pockets of residential areas among the businesses. The United States Census of 2000 revealed that the median family income in the community was $61,741 and the estimated amount for 2010 was $80,011. The housing market features Craftsman-style bungalows and warehouses re-purposed as apartments as well as some condominiums. Contact friendly local real estate agents to help you explore this vibrant neighborhood and find the perfect place to call home. View our selection of available properties in the Hillcrest area. Check out the latest demographic information available for Hillcrest. Learn more about schools near Hillcrest complete with ratings and contact information. Browse through the top rated businesses in the most popular categories Hillcrest has to offer.